To determine the Cargo Capacity of my Deepwater, I need to look at the other light freighters with deckplans for comparison, which means I am going to do a analysis of the Stock Ships deckplans. But to do that, it seems I need to include a stock YT-1300 deckplan in the analysis because stock YT-1300s are the basis of all the other light freighters in the game. I feel that stock YT-1300s should not be much different than the Falcon in deckplan. How important is that a stock YT-1300's Cargo Capacity be 100 tons? Even with Deckplan Alliance's expanded size, it seems the cargo is really crammed in there. Meaning if a stock YT-1300 can hold 100 tons, a lot of the light freighters are going to end up holding a lot more cargo. Check page 18 of the 1E of Tramp Freighters. It specifically addresses the differences in weight and volume between different types of cargo. Use the base cost and weight table to figure out how much volume a given type of cargo can take, with a common freighter having a capacity of 100 metric tons / 40 cubic meters (IIRC, WEG bumped this to 50 cubic meters in either 2E Tramp Freighters or in Pirates & Privateers). So, for instance, a ship with the above capacity (the 1E version) hauling Minerals (5 metric tons per meter^3) might be able to fit 200 metric tons of minerals into its cargo bays, but it wouldn't be able to lift it. Conversely, the same ship hauling High Tech goods (.5 metric tons per meter^3) would be able to fill the entire 40 cubic meters of cargo space, but would be carrying 20 metric tons. Just think of Cargo Capacity in terms of how much extra mass a ship's engine can push before performance starts to degrade. Exactly what form that degradation would take would be the subject of a house rule, but it's a good place to start. From there, just figure out roughly how many cubic meters of cargo space the ship has in its holds and calculate accordingly. The chart is here: Galaxy Guide 6: Tramp Freighters, Second Edition (missing charts). I couldn't find the 50 cubic meters in my quick look-through of GG6 2e or P&P, but I may have missed it. It seems the Cargo Capacity stat to volume relationship is the key here. I can estimate volume based on the deckplan's apparent cargo space size. So I guess my stock YT-1300 deckplan will determine its cargo capacity. Unfortunately Deckplan Alliance's deckplans aren't that useful - They don't label all the different sections of the ships or even plot out every room. Yeah, it'd be nice if they went into the same amount of detail on the YT-1300 as they did on some of their other ships. The Barloz Medium Freighter, for example, goes into insane, minute detail about the cargo bays, down to the degree of what size objects can be loaded through the loading ramps, the cargo lifts or the port/starboard docking collars, as well as listing the total volume of the bays. I've taken a look at some of those other deckplans and they are nice. I will compare Stock Ships to other published and fan deckplans out there in the conclusion of my analysis for each ship. The Falcon is the only YT-1300 we see the inside of in the films. My first premise for my stock YT-1300 deckplan is that it will be based on the Falcon. No matter how modified it is in engines, hull rating, weapons, shields, etc., I don't see why the stock layout should be drastically different than what we we can glean from the Falcon in the films. And I am not going to bother with all the YT-1300 configurations - I'm only going to make the same configuration as the Falcon. My second premise for the stock YT-1300 is accepting DA's Falcon size enlargement to a 37ish meter length. It's a little better than the current official length of 34ish meters, and WEG's cramped 26.7 never even worked their own deckplan. At this point I'll be using Frank's and the Solo Official Guide's Falcon as the primary bases of my YT-1300 deckplan. There was no Falcon cross-section in the TLJ cross-section book, probably because that film overlaps with TFA and there wouldn't have been time for any modifications. It is interesting that the Solo guide cross-section, which shows us the Falcon at 44 years before TFA/TLJ, replaces the prior cross-section's bulbous escape pod with the coffinlike escape pod that Chewlie launched Rey out of the Falcon in from TLJ. Although never in a film, the bulbous escape pod in the TFA book was considered canon so I consider the Solo Guide coffin escape pod update to be a retcon - It was there all along and just not seen until TLJ. However, I have decided to put my stock YT-1300 deckplan and Stock Ship analysis on hold because the Millennium Falcon: Owner's Workshop Manual is getting an updated edition. Since it features the Lando's Falcon nose on the cover, I assume this is an updated canon version of the book. The first edition is awesome with all the 1300 configurations and other CEC ships. Amazon says the new edition will be released on November 27, 2018. So now I'll get back to the Deepwater. Last night I was looking at the Lantillian GX1 and realized how both WEG deckplans are absolutely awful. Neither one matches the exterior images of the ship, and the outside of the ship looks really dumb anyway. But I have a lot of nostalgia for the Longshot so I want to salvage the WEG deckplans. I have a plan to come up with altered deckplans and exterior visuals for three stock Lantillian ships in a series of six Lantillian ships. But I'll finish the Deepwater first! If you find it, please let me know for reference. Do you think 50 cubic meters per 100 tons of the cargo capacity stat is better than 40? Found it. The Far Orbit Project, page 22, in the Cargo Tonnage vs. Cargo Space Sidebar. It's interesting to note that the 100 metric tons / 40 cubic meters in 1E Tramp Freighters was actually removed from 2E (see How Much Can I Carry on pages 17-18 of 2E), likely as part of the general "decrunchification" of the 2E version. Also, you'll find a lot of Frank's old work is still on the Deckplans Alliance gallery, in the Old Ships section. The version of the Millennium Falcon you posted isn't there, but there's one that's almost identical, except for the engine section. Personally, I've always felt that the center-line cockpit version of the YT-1300 (the Oota-Goota from Tramp Freighters) was a more efficient design, as it eliminated the long hallway leading to the cockpit. This would, in turn, allow for more cargo volume, while still allowing operation of the cargo loading system (since the cockpit is elevated above the "mouth" between the bow mandibles). Most deckplans that show a center-line cockpit fail to take into account the increase in deck height. Thanks. I'll just go by that 5 tons per 2 cubic meters standard as a basis for calculating the ship's Cargo Capacity stat from the deckplan's estimated total cargo hold volume, since we are talking about the hauling power of fictional starships. If you want to house rule something for going over capacity on the tonnage (providing they still have volume remaining to put more cargo in), knock yourself out. The Old Ships Gallery has a Falcon and his YT-1300 Tradesman (stock) that are both very similar to the one I shared. The archived Falcon deckplan I shared was linked in the Ship of Riddle's Conclusion, but for some reason that exact version is not found on DA. 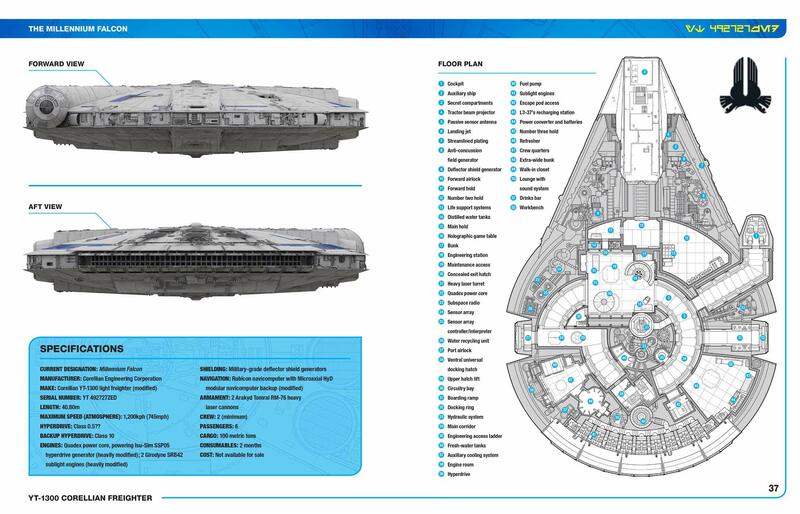 The main aspects I'll be getting from Frank's deckplans seems to be the same in all three - The cockpit, the main hold, the gunwell, the landing ramp and the hallways connecting those - The parts of the ship we see the most of in the films. The modern published cross-sections are all very close to that. I also tend to like more symmetrical ships so the center-cockpit configuration is my fave too. Once I complete my stock deckplan of the Falcon's configuration, it shouldn't be too much trouble for anyone to make whatever configuration deckplan they want. I just remembered something about the weight/volume ratio. A while back, as a mental exercise, I ran the Passenger Conversion ratio (10 metric tons = 1 passenger) based on the 2 metric tons = 1 cubic meter formula from Far Orbit. Using 2.1 meters as a ceiling, you could get a cramped cabin with double bunks taking up about 2 x ~2.75 meters of floor space, probably weighing in at ~1 metric ton to account for the full weight of the furnishings, at a cost of 10 cubic meters (from 20 metric tons). If you use the 5/2 conversion ratio from 1E, you end up less usable square meterage. The YT-1300 is well suited to this conversion as you can simply take "slices of the pie" around the outer edge and convert them from cargo bays to passenger cabins. I mess-up in my last post. I meant I'll use the Far Orbit 2/1 ratio. Oops. Since there is some generalization from the Falcon in the system, we have to account for higher ceilings for Chewbacca who is 2.3 meters tall. There could be other tall beings too that shouldn't have to duck or bang their head standing up in their ship. Now if there is a class of ships made by Ugnaughts, yeah maybe they have short ceilings, but that wouldn't work for a lot of PC groups. Even 2.1 meter ceilings aren't going to cut it for some characters. I thought it was interesting to find out that the "common" area of the Falcon with the holochess game is actually the main cargo hold. In the films that showed it, it just never had cargo in it. It makes sense since even a rightfully expanded ship is still so small and tightly packed with stuff. There is no way to have a lot of cargo and passenger space both but it does seem very easy imagine different variations of the ship having passenger or cargo space. Incidentally, I got my math wrong. 10 cubic meters with a ceiling height of 2.1 meters would get about 2 x 2.38 meters on a floor plan. Here is the Solo (pre-Maw) Falcon from the upcoming new edition of the Millennium Falcon: Owner's Workshop Manual. They went with the off-center main hold, which I know Frank doesn't like. IIRC, the main complaint (from Ship of Riddles, not Frank) about the offset main hold was that the front-left corner (viewed from above) would actually protrude through the main hull. Good to know. It's not that bad because it is not so forward or off-center. Forward of the main hold on the port side is a forward hold, but that was never seen in the films and that could be a hold you have to duck in and out of. The same problem of his complaint could exist for any room near the outside of the ship except for hallway to the cockpit and the hallways to the port airlock and starboard docking ring/entrance ramp. None of those areas were seen in films except for Lando's quarters, and I don't remember if the ceiling of the back of the quarters were shown sloping down. Taking the exterior of the ship and the parts of the interior we have seen in the films, there's probably no deckplan that will still not require some disbelief suspension, but of course that doesn't mean we shouldn't try to make one as sensible as possible. Making the ship bigger than the official length helps quite a bit, but I don't think even the films officially go by that figure. Look at the deckplan's cockpit. The cockpit in the films does not seem that cramped. Only if the ceiling in the room was uniformly same height. The last time I watched Solo, I noticed that the main hold's ceiling sloped along the curve of outer hull. Is it still too tall? Maybe. But Disney is trying to maintain some relationship of the inside of the ship to the outside. Each passenger cabin has three bunks, a compact refresher, and a storage compartment. Although the slope of the ceilings limited the headroom above the bunks outermost from the ship's center, CEC conversion kits allowed the remaining bunks to be transformed into bunk beds for a total of five per cabin. This is from the new YT-1300 Owner's Workshop Manual in a description of the 1300p, the first ship in the book. Solo follows characters as they walk down corridors, and we see more rooms of the Falcon than we ever had in other films. Maybe there is a bit of retconning going on, but the film production seemed very committed to some diagram which is reflected in the Solo official guide, and the new YT-1300 manual deckplan. The other thing to keep in mind, the official length of the Falcon has increased since the WEG days so it is now 34.75m. That is almost the ~37.5 that DA says is better. I agree because it seems the official deckplans cockpits are still a little cramped for what we see in all the films. A little increase from from 34.75 to 37.5 won't break anything. The Owner's Workshop Manuals amusingly include in-universe explanations for erroneously short ship lengths and incorrect deckplans to account for the WEG length and the multiplicity of deckplans for the stock YT-1300 (Platt's Smugglers Guide has one and WotC had one, plus perhaps more). All of that plus the new edition matching up to the TLJ and Solo really work to establish this book as the standard. The small increase to the current "official" length increases all dimensions proportionally, which means the Falcon is a little taller than the official size would have it, and that gives us a little more headroom. And, we have the cargo capacity stat to volume formula to work with to reverse engineer the cargo capacity of starship deckplans. So now I'm a lot more ok with just accepting the modern official Falcon and general YT-1300 deckplans as close and not worry about making my own stock YT-1300 deckplan. I have never had a PC group's ship be a YT-1300 after my very first WEG Star Wars campaign, and NPC-flown YT-1300s have only rarely appeared in my game. The Falcon is special and I love seeing it on the movie screen, but I don't really even care for the ship design and feel the Falcon should stay special by not showing a thousand Falcon-like ships in my SWU. YT-1300s may still be plentiful in my SWU but they just so happen to not appear in my adventures much. There are a lot of ships out there.